A warm welcome to our new yogi Sue Bayliss who will be teaching regular Healing Yoga sessions from this September at our clinic here in Norwich. Sue will also be hosting an evening at the end of this month to talk about how yoga can help us to feel more confident and empowered as women. ♀ Get into your body and feel it from the inside rather than worrying what it looks like from the outside. ♀ Honour your rhythms and cycles and develop self-compassion. ♀ Learn about Goddesses in a variety of traditions, not only Indian. ♀ Relax and renew yourself by feeling the benefits of restorative yoga. ♀ Feel empowered listening to visualisations and experiencing yoga nidra. Good for feeling your body from the inside rather than viewing it from outside. We will finish with a total relaxation. Donation only: recommended £5 – 10. Sue has been practising as a holistic therapist for over 25 years. She has developed her own eye movement therapy for trauma and her work is based on the latest mind body science. She has practices in Salhouse, Norwich and London. After completing a training to be a priestess of Rhiannon in Glastonbury, she added yoga to her many skills. As well as her therapeutic work, she also offers wellbeing workshops and consultancy to organisations and has been given work creating a wellbeing programme for the Shaw Trust in Norwich to include yoga. 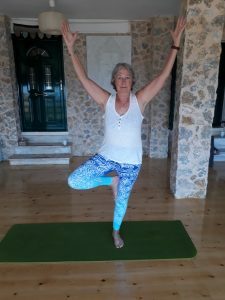 Sue is passionate about the many benefits yoga can bring and will be starting yoga classes in Healing Yoga (perfect to de-stress and lift the spirits) and Goddess Yoga, an empowering form of yoga geared to the female body and its cycles at the clinic in September. For more details visit www.sulisconsulting.com and via Facebook – Sue Bayliss – Pathways to Wellbeing.